Dagashi-ya — Japanese Kids’ Socializing Store! Before 1980’s, every town in Japan had a dagashi-ya (dagashi store), which sells kids-affordable candies and small toys. 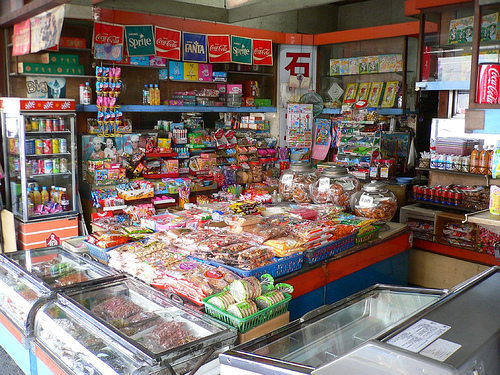 In a small dagashi store, there are all kinds of cheap small candies and snack packs, ice candies, sodas, and toys such as water balloons, fireworks, and plastic models. There are usually a bench and a couple of capsule toy machines out side of the store. Kids get together at a dagashi store after school and enjoy some candies and play there. Although dagashi-ya decreased in the last three decades, there are some replicated dagashi-ya seen in shopping malls and department stores.